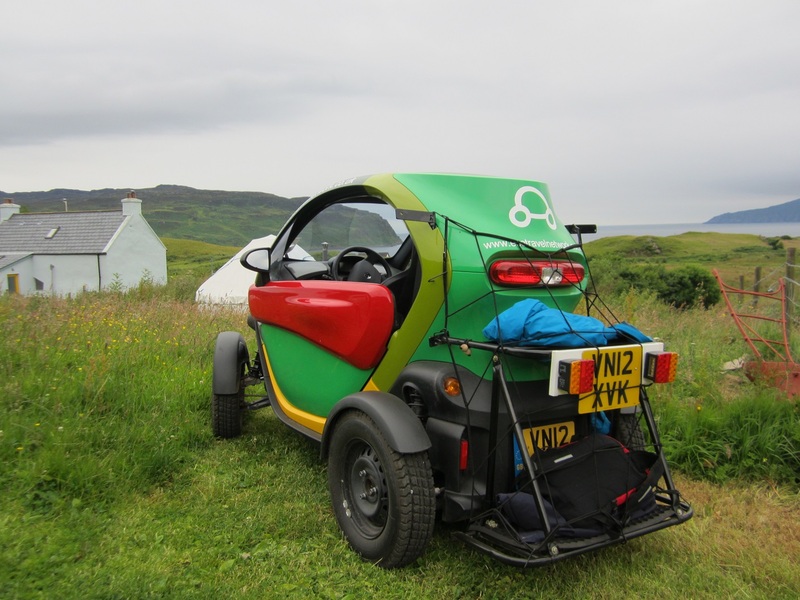 The Prospectors (with their Eco Travel Network hats on) have just been delivering a modified Rural Twizy up to the Isle of Eigg for the start of a trial. You can read all about our adventures here or the official announcement about the trial here. We are intrigued to see how well the Rural Twizy works on an island where range is not an issue and they generate all their own electricity. However their need for carrying supplies, people and luggage from the ferry to their homes and the bumpy nature of many of their access tracks will be a challenge. We hope to introduce an electric road legal buggy ( developed in collaboration with Edinburgh College) later in the trial. We are tracking the vehicle and doing our best to measure its energy consumption. We will also be collecting qualitative feedback on utility, cost and design. This entry was posted in Psychology, Technology and tagged Eigg, electric vehicle trial, Twizy. Bookmark the permalink.